Mojang Studios announced today that it will improve the world generator in the smash hit Minecraft to reduce the amount of water and increase the number of islands, among other improvements. The developer says several issues will be fixed, including decreasing the size of oceans, biomes intelligently placed and a wider variation in terrain. Mojang doesn&apos;t like to make changes to its world generator in small steps because it causes a visible border between the old and new terrain. With this update, 1.7, the studio is making many chances at once. Minecraft&apos;s new world generator will result in more island as well as new biomes and moving their placement so that they&apos;re not randomly distributed; Jungle will not sit directly next to snow-covered peaks for instance. Also added are small details like new flowers and trees. 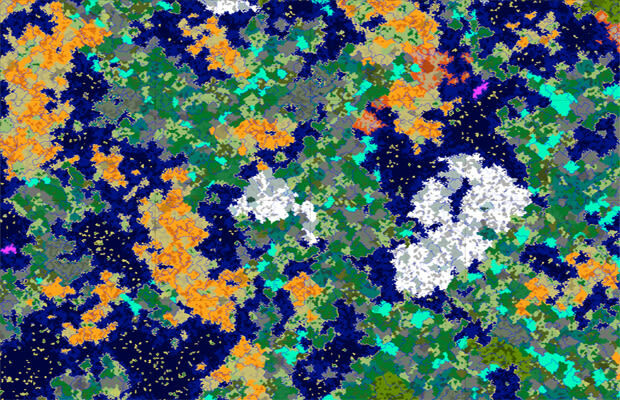 The world generator can be seen above, the amount of ocean has been halved, at least. No date has been given for the release of the 1.7 update, but you can currently play Minecraft on nearly everything with an on button. RELATED: MoMA Expanding Applied Design to Include "Minecraft"